Multi-Point locking mechanisms used on sliding patio doors have been manufactured by Truth, Marvin, Fuhr, Hoppe or a half dozen others. When the door is fully closed, the thumb turn latches at two, three or more points into keepers or around strikes in the jamb. Fifty percent of the time, maintenance issues with these high-security style locks can be contributed to the keepers, which may just be out of adjustment or alignment. With these designs, the thumb turn cannot move the latches until the door is completely closed and a “plunger”, protruding from the jam, presses against a “trap door” on the face of the mechanism, which releases the latches to move into place… thus, locking the door. 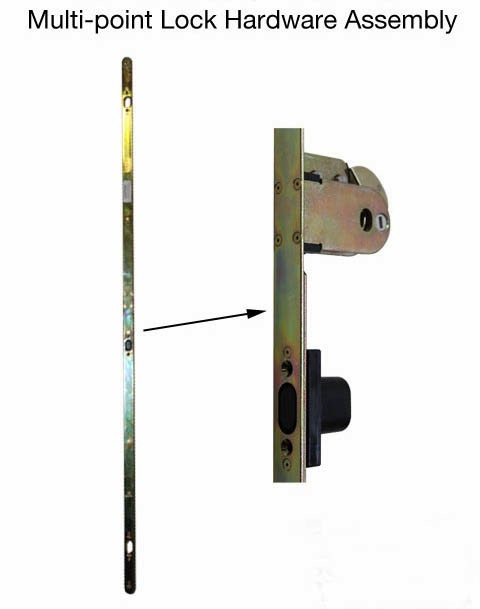 Or, with some manufacturers, the door handle needs to be held down as the door is closed in order to release the latches… and, then the latches can engage the keepers when the handle is released. The other half of the time, maintenance issues are the result of bent latches or components internal to the locking mechanism. This usually happens when someone has tried to adjust the keepers or they gradually moved out of adjustment over the years. When the person closed the door and twisted the thumb turn to move the latches, the latches did not fully catch the keepers. Then, opening the door without twisting the thumb turn back to return the latches to the open positions, the door was closed again and the keepers hit and bent the mechanism which was still in the closed position. You can take the entire mechanism apart and play with it for a couple of hours and you might be able to straighten out the bent components. But, you are better off just buying a whole new mechanism for a few hundred bucks. Note: When ordering a new multi-point mechanism, you will need to measure the length, width, offset and possibly several other dimensions. The right one is not hard to find on the Internet. Replacement of the entire mechanism can take less than one half hour and adjusting the keepers can take up to another half hour. Suggestion: Remove the keepers and then replace individually to adjust them one at a time.